Lithium Polymer lasts twice as long as Lithium Ion and is as safe as traditional lead acid batteries. You can now enjoy a lightweight battery that will simply drop in as a direct replacement for your traditional lead acid battery on any golf trolley. It weighs in at 2.9kg and measures just 170mm x 130mm x 110mm, that's less than 1/4 of the weight and 1/3 the size of a traditional lead acid battery and includes a 5-year limited warranty**. Comes complete with Battery, battery bag charger, and "T" bar connection lead. 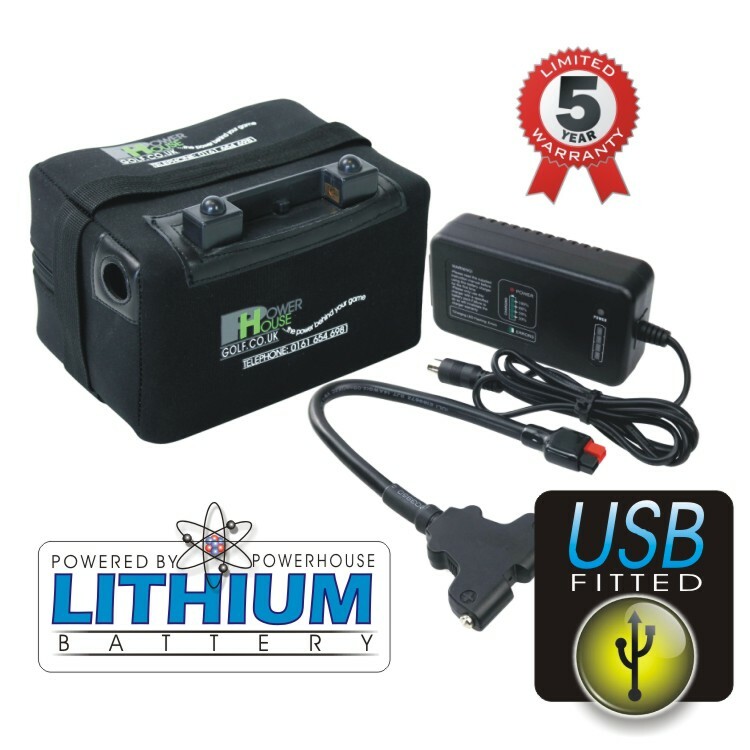 The Powerhouse Golf Lithium Battery LiFePO4 is far safer than the standard Lithium Ion battery that is now being banned from most aircraft, it also has a 50% more life expectancy. It is supplied fully protected by a sophisticated specially designed lithium battery management system that constantly monitors every cell to ensure the battery is always optimised for best performance and life. Comes with Powerhouse Torberry to T-Bar connections. T-Bar can be removed so customer can use existing battery lead. New for 2017* Built in USB port allows you to charge any device with a USB cable, such as mobile phones and GPS devices. Applications: Suitable for use with the Powerhouse Freedom Range and other golf trolleys. Duration: 36+ hole capacity depending on terrain and conditions. This Battery will work with many trolleys that use the black and red plug ( Torberry) and also the "T" Bar fitting. below are a few examples, If you do not see your model just email and we can tell you if the battery is compatable or not. Advantage. Auriol. Caddya Caddymatic. Club Runner. Compact Caddy. Duratrolley. Eagle. Easycaddy. e-Caddy. Electracaddy. Electric Blue. Electronic. Energy. Europro. Field & Scott. Foissy. Fraser. GoCaddy. Golf Glider. Go Kart. Golfstream. Greenhill. G-TECH. Hill Billy. Hillman. Kaddie Boy. Kaddilite. Lectronic. Masters. Max Golf. MGI. Mocad. Motocaddy S1, S2, S3. Pegasus. Powakaddy. RoboKaddy. Power Bug. Power Drive. PowerPro. Golf Precision. Pro Trolley. ProCaddy. Powerhouse. Pulsar. Relaxt. Schnieder. Slazenger. S-Line. Stewart Golf. Stomatic. Strolla. Supertroll. Talisman. TopCart .Trolem. Trooper. Ultracaddy. Utech. Walmex. 22Ah Lithium batteries have an addition limited 5-year warranty on the battery. It is our intention to supply a product that provides and gives faultless service during its lifetime. However, from time to time things can go wrong. Your battery is shipped as standard with a full comprehensive warranty as explained on the "Warranty tab". *However, should your battery develop a fault and needs to be returned to us, it can only be shipped using a carrier company certified to do so, and not Royal Mail. The current price of this service to send and return is £12.99. The "Additional Transport Warranty" covers this return/redelivery for 2 years. We do not expect the battery to fail, but in the event of it doing so, everything is covered. Just notify us and we will do the rest.